Centrally located and quiet. Right in the middle of Schwabing (at Kurfürstenplatz) but peaceful with a nice little garden and a spacious terrace. 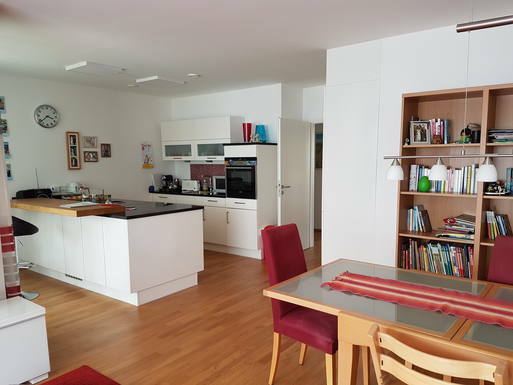 The 95 square metre apartment has one master bedroom, a children`s bedroom with an upper bed for 2 children, a big living room, kitchen, one bathroom with bathtub and a guest WC. Everything you need is just across the street: supermarkets, bakeries and one of munich`s most liked food markets, the Elisabethmarkt. Schwabing is one of munich`s most popular districts with a large variety of bars, restaurants and boutiques. It also hosts one of the world`s biggest inner city parks, the Englischer Garten as well as a number of world famous museums like the Pinakotheken, Museum Brandhorst or Haus der Kunst. All of Schwabing is easily accessible by foot or bike. To get to other parts of munich there are numerous busses, trams and metro lines within walking distance. There are numerous cafes, bars and restaurants in walking distance. Hohenzollernstrasse is also one of munich`s most liked shoppnig miles with a lot of small boutiques. Hohenzollernstrasse than leads into Leopoldstrasse probably munich`s most famous boulevard. A short walk away lies the englischer garden one of europe`s biggest inner citiy parks. For Art Lovers the "museum island" is just 3 tram stations (or a 20 minute walk) away. the old, new and mdern Pinakotheken and Museum Brandhorst feature everything from the old masters to contempary artists. Another great place for shopping, drinking and eating is Kurfürstenstrasse and the university district alsp just around the corner. It's important for us to find the house clean and tidy when we get back.